Odds vary by autograph grouping. Click here for insertion rates and short print info. With more than 15 years of history, 2011-12 SP Authentic Hockey sees the return of one of the NHL's most popular brands. Every year Autographed Future Watch rookie cards are some of the most coveted in the hobby. Staying true to form, 2011-12 SP Authentic Hockey gives collectors a ton of first-year player options and autograph opportunities. 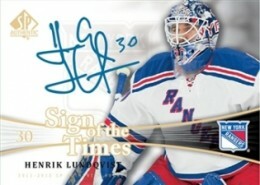 Hobby boxes come with three autographs, including at least one autographed Future Watch card numbered to 999. Traditionalists will also be happy to know that Rookie Holo F/X, Sign of the Times autographs and SP Chirography autographs all return. 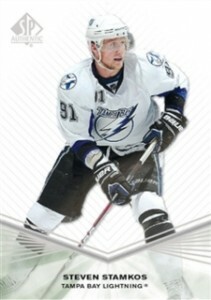 The 2011-12 SP Authentic Hockey base set is made up of 150 cards. Base set parallels: Limited Autograph Patch Level 1 (/100), Limited Autograph Patch Level 2 (/25), Limited Patch Level 2 (/25). 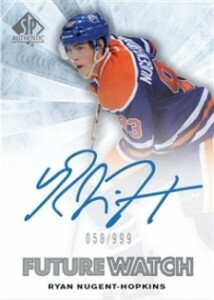 Collectors can expect three autographs from every box including one or two Future Watch rookie cards numbered to 999. Future Watch Autographed Patch cards (/100) parallel the basic rookies. Sign of the Times Duals (1:288). Sign of the Times Trios (/25). Sign of the Times Quads (/10). Sign of the Times Fives (/8). Sign of the Times Sixes (/7). Sign of the Times Sevens (/6). Sign of the Times Eights (/5). 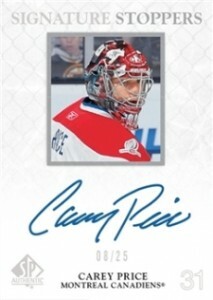 Signature Stoppers, which focus solely on NHL goalies (/25). Rookie Holo F/X (1:12) keeps the tradition of holograms going. Parallel: Rookie Holo F/X Die-Cut (1:288). Rookie Extended Series (1:2) offers more freshman options. A parallel numbered to 10 also exists. Great product for the price. This stuff is fun to open.